My interview with Heritage leader Raffi Hovannisian was published on the Armenian Weekly web site yesterday. I recorded the interview while he was on his hunger strike in Yerevan’s Liberty Square on Saturday. 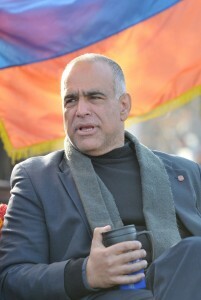 Raffi Hovannisian at Liberty Square, March 17, 2011. Karen Minasyan photo. If we postpone to the next cycle of elections the resolution of the issues that face us today, we’ll find ourselves in front of a predetermined election, in other words the people will become more fatalistic than they are today. We talk about what is real in Armenia, which means do nothing or there’s a great danger of renewed violence because there’s a lot of pent-up frustration based on the injustice, inequality, and unlawfulness that reigns in the country today. So my one expectation is from the authorities, and the second expectation is from civil society, from the Armenian public, to find itself the master of the public agenda and not to wait for anybody, whether it’s the incumbent president or opposition parties, to tell it from rostrums and podiums and elsewhere what to do, to empower the Armenian public with the message that their rights are in their hands, that this square, the symbol of liberty, democracy, and liberation for Artsakh, belongs to all Armenians, and there’s no reason for Armenians to be displaced from this square, from their expression of their free will and different views. And I’m happy to report that thousands of people entered the square for the rally on Thursday [March 17] to express solidarity, to take back the square, and to exercise their constitutional rights to be the masters of the square. The important thing now is for the Armenian people to be the master of their own destiny and their own political agenda. You can read the interview in its entirety on the Armenian Weekly’s web site. 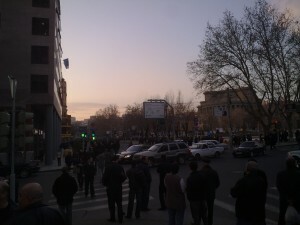 I just returned from the vicinity of Yerevan’s Opera House where protesters who had been attending a rally given by Levon Ter-Petrossian’s Armenian National Congress up the street at the Matenadaran had congregated. The protesters were able to enter Liberty Square after the Congress’s leaders negotiated with the police. There were policemen in riot gear shields in hand around the perimeter of the Opera park. Everything there is peaceful. What had the potential of being ugly did not get out of hand. Having said that, there are still zero signs of revolution in the air. All the stores in the area were open for business, people were window shopping, walking their dogs, eating shawerma sandwiches. Nothing seemed out of the ordinary. 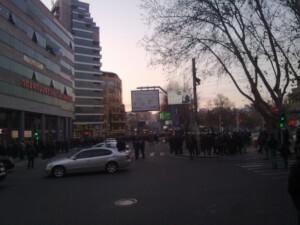 True, some protesters blocked off the portion of Tumanyan Street that spans alongside the Opera area, but that caused at the most 15-20 minutes of inconvenience. According to RFE/RL, two political prisoners were released today. But I can’t help but wonder what difference that will make. If that has become the sole expectation from these rallies, it’s not enough to bring about change, the nature of which still has yet to be defined by whoever wants it. I really don’t understand who they are. I am not convinced that even the people who attended the rally, typically numbering at the most 10,000, if that, necessarily want any kind of deviation from the status quo. I couldn’t sense it from the people roaming along the sidewalks and certainly not from the middle-aged men standing around smoking and eating sunflower seeds in Liberty Square. Can this be the ‘revolution’ people have been buzzing about lately? A convincing, compassionate leader is needed in the opposition camp, a person who would be able to negotiate with the oligarchs from the start of a “revolution” to ensure that a somewhat smooth transition can be effective without much obvious turbulence. The oligarchic structure in place is deep-rooted in the economy, with certain families enjoying monopolistic control of staple foodstuffs or basic consumer goods; any abrupt rupture could feasibly cause the entire Armenian economy to collapse within a day. Nevertheless, for change in the form of “revolution” to happen, it will mean massive upheaval as an indignant public attempts to transform an institution known to be undemocratic, corrupt, and unjust into one that satisfies their interests of proper government. As we’re seeing in North Africa now, change will also bring about violence, death, and more importantly, wild uncertainty. And no one who is living a relatively decent life today, especially those comprising the nouveau riche of Armenian society, is willing to take such a gamble—to risk their own lives and those of their loved ones without promises of a better future. What do you think? Please leave comments here or on the Weekly’s site (or even better, on both sites).